Our grading toolset enables educators to provide rich feedback. The reuseable comment library can be used to create grading rubrics. Students love the online portfolio where they can see upcoming assignments and review past assessments. There is no comparison between Crowdmark and pen and paper assessment. I was able to mark three times the amount of student work in less than a third of the time it would have taken me...with a pen in my hand. The efficiency that the program allows, the streamlined interface, and the simplistic methods of using it all added up to a program that is, simply, the future of marking. The interface is easy to use. Grading is much faster and easier. I loved how we did not have to handle the exams themselves. With Crowdmark, teachers are able to mark in their own homes using their own personal devices. There is no need to be sitting in warehouse and marking the exams in person. All exams could be stored on a server. This App has the potential to save time, expenses, and money. I liked the feature of easily accessing student work and seamlessly assessing one question at a time. It is easier to complete marking with standards such as EQAO rubrics while looking only at one question from the test for all students... It is easier, as you do not need to flip back and forth through stapled pages. Rich, descriptive feedback to students can be delivered easily in the online workflow. Comment boxes left on student work support hyperlinks, embedded images, and mathematical equations which can create new learning opportunities. For example, a student can be directed via hyperlink to a video explaining the solution to a math problem or historical fact. Crowdmark provides pathways to drive innovation in curriculum design and pedagogy. 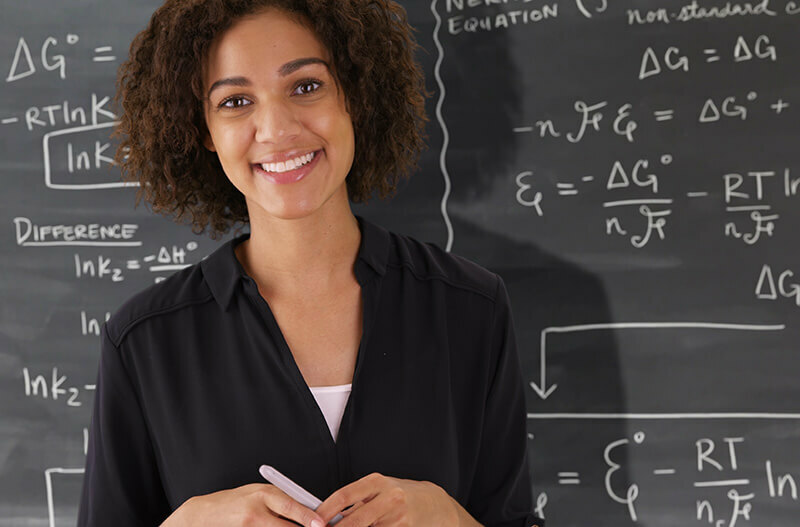 Teachers can easily test and iterate on new approaches to teaching while collaborating with teachers in other schools or districts. This provides opportunities for instructors to improve their teaching practice and new channels for communication within Professional Learning Networks (PLN). Crowdmark stores all assessments with instructor feedback securely in the cloud. Over time, this creates an easily accessed digital portfolio that can be used for further study, personalization of instruction and detailed evaluation of learning achievement. Teachers can choose to share this portfolio with parents to review their child’s progress throughout the year. Grade anywhere, anytime. 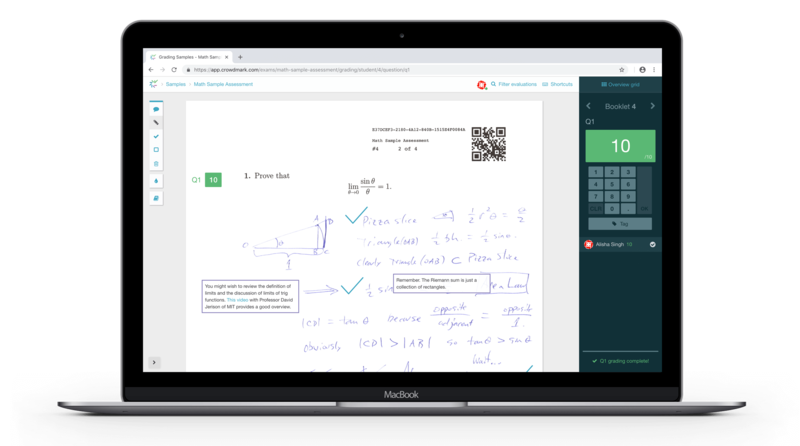 With Crowdmark teachers can grade assessments with ease from any Internet connected device from anywhere. Paper, paper and more paper. Teachers are forced to stay late at school to grade assessments or carry stacks of paper home and back. Teachers can collaboratively evaluate student work online with moderation. The moderated evaluations can be performed anywhere and at anytime. Moderated grading requires teachers to assemble in the same room at the same time. Scheduling is a hassle. Teachers can provide rich feedback that includes annotations, comments, scores, embedded images and hyperlinks to online resources to support further learning. Teachers use a red pen to provide comments in the margin with a number score. A digital copy of student homework, assignments, lab reports, midterms and finals together with teacher feedback is stored in the cloud creating an easily accessible student portfolio. Assessments can be stored in a file folder at home or at school. That is, if pages aren’t lost or forgotten. Teachers can access the student portfolio to enrich discussions with parents by showing examples of student work. Teachers can digitally share student work and associated assessment feedback with parents. Parents are sometimes shown scores in a grade book. Examples of student work can be sent home in the student’s backpack to parents for review. Crowdmark can be licensed by individual schools or school boards. We offer several options including a trial offer to help get you started right away.